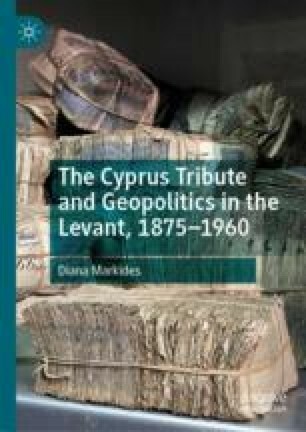 The complex regional context of Disraeli’s occupation of Cyprus was analysed in Chapter 1. We will now turn to the mechanics of the implementation of the Convention policy as regards Cyprus, the obstacles it faced within the island, the procedure for impounding the existing surpluses and the developments surrounding the calculation and formal establishment of what may be called the “Cyprus tribute policy”, always within the context of similar developments in a bankrupt Levant. Rappas, Alexis. 2018. The Sultan’s Domain: British Cyprus’ Role in the Redefinition of Property Regimes in the Post-Ottoman Island. The International History Review 1–26. https://doi.org/10.1080/07075332.2018.1447000.